If you have had access to the internet for the past year, you are probably aware of the feud between Apple and Samsung over the latter’s supposed theft of features from the iPad and iPhone. 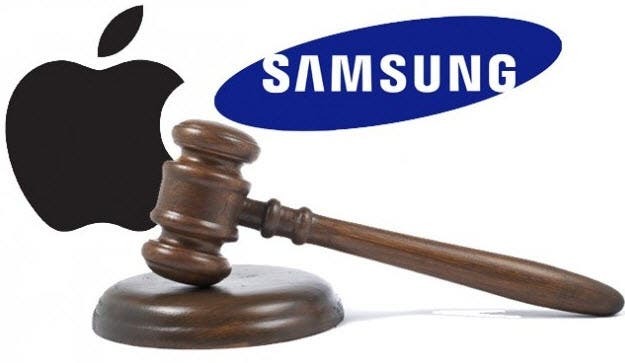 Apple won the lawsuit in the United States, meriting a 1 billion dollar fine from Samsung but now, Apple lost its appeal at the U.K. High Court. This required Apple to publish a notice on their U.K. website’s homepage that stated the court’s finding that Samsung did not borrow its patents. Apple used it as a clever way to slam the competitor. Originally, it was ruled that Apple must have that notice up on its U.K. website, as well as some printed publications in the United Kingdom for one month. Apple complied by adding a small link at the bottom the page that said “Samsung/Apple UK judgment” to verify that Samsung did not break any laws in the U.K.
“On 9th July 2012 the High Court of Justice of England and Wales ruled that Samsung Electronic (UK) Limited’s Galaxy Tablet Computer, namely the Galaxy Tab 10.1, Tab 8.9 and Tab 7.7 do not infringe Apple’s registered design No. 0000181607-0001. They were ordered to remove the statement and Apple has since updated and edited its apology to Samsung after a U.K. Court of Appeal found it to be “untrue” and “incorrect”. Robin Jacob, the U.K. appeals court judge said that he was “…at a loss that a company such as Apple would do this,” also adding that Apple had breached their order by saying what they did on their U.K. website. On 9th July 2012 the High Court of Justice of England and Wales ruled that Samsung Electronic (UK) Limited’s Galaxy Tablet Computer, namely the Galaxy Tab 10.1, Tab 8.9 and Tab 7.7 do not infringe Apple’s registered design No. 0000181607-0001. A copy of the full judgment of the High court is available on the following link www.bailii.org/ew/cases/EWHC/Patents/2012/1882.html. That Judgment has effect throughout the European Union and was upheld by the Court of Appeal on 18 October 2012. A copy of the Court of Appeal’s judgment is available on the following link www.bailii.org/ew/cases/EWCA/Civ/2012/1339.html. There is no injunction in respect of the registered design in force anywhere in Europe.